We are proud to present you the 3D edition of the famous game Elemental Galaxy! 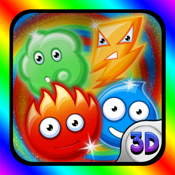 This is a fresh puzzle game that represents the latest evolution of match-3 games! Feel the universe in this innovative, addictive and exciting puzzle game! The universe, in its primordial state, needs your help to spread elements in all worlds to bring life to everything. Have fun blasting elements, make elemental chains to maximize the effect, and use shadow and light elemental powers to your advantage to move up the levels to the endless galaxy! * Innovative gameplay with nice 3D graphics and animated backgrounds. * 50 levels filled with fun plus an Endless mode. * 7 Unlockable new graphic skins! * GameCenter leaderboards, with tons of achievements!